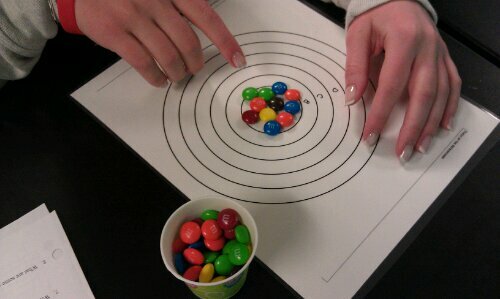 College-Prep Physics: In the second half of the block, students studied the relationship between telescope diameter and its light collecting capacity by counting the number of M&Ms (photons!) that can fit in circles of different diameters (pictured above). The circles had diameters of 2″ – 7″. I know inches is frowned upon in science, but telescope diameters are typically given in inches, plus the mathematical model relating the diameter of the circle to the number of M&Ms comes out really nicely when using inches. One 42-oz bag of M&Ms filled 16 3-oz bathroom cups (one cup per group, so that was exactly what I needed for 2 classes of 8 groups.). Here’s the lab sheet. In the first half of the block, students predicted where events might fall on the cosmic calendar. Each pair was given on event on a post-it and asked to place it in the appropriate month (pictured above). Then we watched an updated version of Carl Sagan’s Cosmic Calendar and we reflected upon our guesses and the actual placement. Here’s the sheet (front) and the calendar (back). Conceptual Physics: We reviewed several parts of a cars electrical system (alternator, alternator belt, spark plugs, and battery) from last Thursday’s sub plans. 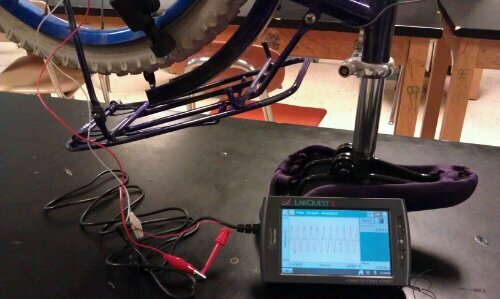 Then we looked at Voltage vs. Time data for a several D-cell batteries (constant voltage, familiar from our defibrillator circuit studies) and for the bike light generator (pictured, alternating voltage, new concept). FYI, in order to get the nice oscillating voltage graph (rather than a noisy looking graph), the LabQuest voltage probe was set to collect 2000 data points/second for 0.1 second.